Outline of ball valve - Shanghai Taitong Valve Co., Ltd.
Design & manufacture:API 6D、API 608、ASME B16.34、ANSI／AWWA C507、MSS SP-72、BS 5351、BS 6364、BFCI 70-2、ISO 5211、NACE MR0175 . Connection ends:ASME B16.5、ASME B16.47、API 605、MSS SP-44、ISO 7005-1、JIS B2238、BS 12627、ASME B16.25、ASME B16.11、BS 12760 . The structure design of elastic sealing ring has been adopted for floating ball valves. This seat design features a bigger sealing pressure ratio between the ring surface and the ball when medium pressure gets lower, where the contacting area is smaller. Thus, the reliable seal is ensured. When the medium pressure gets higher, the contacting area between seat ring and ball becomes bigger as the sealing ring transforms elastically to undertake the bigger force pushed by the medium without any damage. With the valve heated in a fire application, the non-metal material parts such as seat sealing ring of PTFE, stem back seat gasket, gland packing, and the sealing gasket between body and bonnet might disintegrate or be damaged due to high temperature. CHAODA’s specially designed structure of auxiliary metal to metal seal is provided to effectively prevent both internal and external leakage of the valve. As required by customers, CHAODA’s floating ball valves with fire safe design can meet the requirement of API 607, API 6FA, BS 6755 and JB/T 6899. The blow-out proof design has been adopted for the stem to ensure that even if the pressure in the body cavity is risen accidently and the packing flange becomes invalid, the stem may not be blown out by medium. The stem features the design with a backseat, being assembled from underneath. The sealing force against the backseat gets higher as the medium pressure becomes higher. So the reliable seal of the stem can be assured under variable medium pressure. V type packing structure has been employed to effectively transform the pushing force of the gland flange and the medium pressure into the sealing force against the stem. The traditional packing flange design has been improved to be of two piece structure, i.e., being as a gland flange and gland, the latter contacts the gland flange with spherical surface. 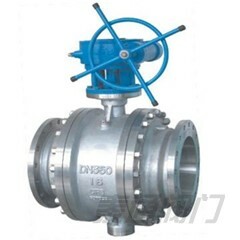 Thus, the gland remains vertical always, and is lined internally with a PTFE bush to prevent the galling against and friction between the stem, which can also reduce the operation torque of the valve. Based on customers’ requirement, a packing tightening design may be employed to obtain more reliable stem packing seal, which is loaded by bevelling spring. The traditional packing flange design has been improved to be of two piece structure, i.e., being as a packing flange plate and a follower, the latter contacts the flange plate with spherical surface. Thus, the follower remains vertical always, and is lined internally with a PTFE bush to prevent the galling against and friction between the stem, which can also reduce the operation torque of the valve. To prevent the ball valve from wrong operation, the key lock with 90° of open and close positioning pad has been provided, which can be lockable as required. At the stem head, where the lever fixes, a flat is so designed that the valve opens with the lever in parallel to piping, and with the lever right-angled to the piping, the valve is closed. So,it is ensured that the valve indicator of open and close can never make mistake.